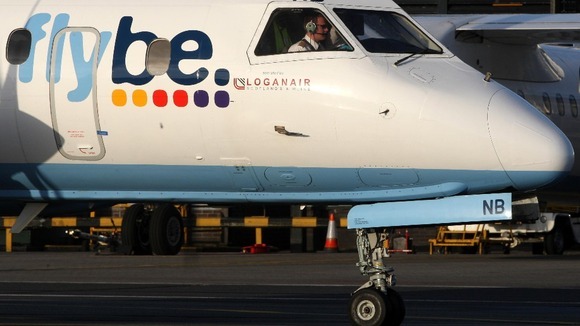 Regional airline Flybe is expected to announce annual losses for the year to March will be bigger than feared at around £23 million when it reports annual figures on Friday after a turbulent year. Fly be says it has been squeezed by higher fuel costs and the tough economy. It has been taking tough action reverse the losses, recently quitting Gatwick Airport by selling its 25 pairs of landing slots there to easyJet for £20 million, while also slashing jobs and cutting its pilots’ pay by 5%. Flybe currently has about half a million domestic passengers per year at Gatwick. The airline also revealed another 80 redundancies, on top of almost 600 staff – or 22% of its workforce – who have been axed so far as part of plans to save at least £35 million a year. In January Fl ybe reported a loss of £1.3m in the six months to 30 September. That compared with a profit of £14.3m a year earlier. Regional airline Flybe is expected to dive deeper into the red when it reports annual figures on Friday after a turbulent year. The Exeter-based carrier recently warned annual losses for the year to March will be bigger than feared at around £23 million as it is squeezed by higher fuel costs and the tough economy. It has been taking tough action to pull the business out of its tailspin, most recently quitting Gatwick Airport by selling its runway space there to budget rival easyJet for £20 million, while also slashing jobs and cutting its pilots’ pay by 5%. Flybe is selling 25 pairs of take-off and landing slots to raise vital funds in a move that will see it will cease all flights from Gatwick, where it currently flies more than half a million passengers to destinations around the UK. The airline also revealed another 80 redundancies, on top of almost 600 staff – or 22% of its workforce – who have been axed so far as part of plans to save at least £35 million a year. Flybe is in talks about selling its 25 Gatwick landing slots to raise money, as it is expected to announce a large financial loss – about £14 million – for last year. The slots could raise up to £20 million. Easyjet is one of the companies Flybe is believed to be in discussions with to sell to. Flybe was floated on the stock market at the end of 2010. Since then it has faced soaring fuel costs, falling passenger numbers and higher airport duty. It is currently axing about 10% of its 3,000-strong UK workforce to cut costs by at least £35m. It is also reviewing its network of 13 UK bases of Aberdeen, Belfast City, Birmingham, Edinburgh, Exeter, Guernsey, Glasgow, Inverness, Isle of Man, Jersey, Manchester, Newcastle and Southampton. Last week, BALPA confirmed Flybe’s pilots had agreed to a 5% pay cut to avoid compulsory redundancies. If Flybe sells all its Gatwick slots, that only leaves it a few London slots, at Luton. 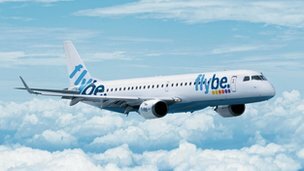 Regional airline Flybe has said it is planning to cut about 300 jobs as part of a programme to return the carrier to profitability in 2013-14. The Exeter-based airline said the cuts would lower UK staff numbers by 10%, reducing costs by £35m. Flybe said it did not expect “significant” changes to the number of its UK bases or routes, but said it would be reviewing its network. The airline reported a loss of £1.3m in the six months to 30 September. That compared with a profit of £14.3m a year earlier. The airline has blamed its poor results on rising fuel costs and falling demand because of increases in air passenger duty. Under the turnaround plan, the company said it would reorganise itself into two divisions. Flybe UK will cover all UK-based scheduled flight services, while Flybe Outsourcing Solutions will cover all outsourced services such as contract flying and training. The job losses will be seen in the Flybe UK business, with 20% of management posts going and 10% of support and production roles being cut. The airline said consultation with affected staff and their trade unions would start immediately. The Prospect union, which represents some Flybe engineers, said it did not support the airline’s plans. “While we acknowledge that the UK’s continuing economic weakness is having a negative impact on business, we have yet to be convinced that the combination of job losses and the outsourcing of line maintenance put forward today provides the answer,” said Prospect negotiator John Stevenson. As well as job cuts, Flybe said it would be seeking to cut costs with suppliers, start a fuel efficiency programme and introduce more automated check-ins. “I am extremely disappointed that many valued and hard-working colleagues may have to leave the organisation,” said Flybe chairman and chief executive Jim French. In a trading update, Flybe said passenger numbers had risen by 1.7% to 1.8 million in the final three months of last year. However, passenger revenues fell 1.2% to £136.9m and costs also rose. Posted: Sunday, June 16th, 2013. Filed in General News, Recent News.